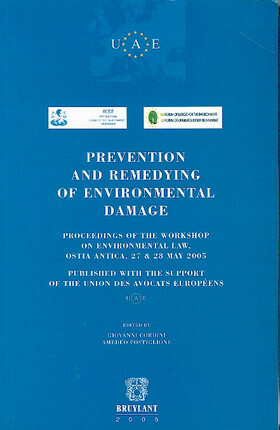 These papers were given at a workshop organised in Ostia Antica from 27 to 28 May 2005, by ICEF (International Court of the Environment Foundation) and the European Forum of Judges for the Environment, in co-operation with the European Commission. The workshop has proposed to assess the state of implementation of national legislation on the prevention and remedying of environmental damage in the twenty five Member States of the European Union, with particular reference to the Directive 2004/35/EC on the issue. The final session has focused on the environmental protection of the ecosystem Mediterranean Sea - Black Sea. Judges, experts, representatives of the Ministries of the Environment from Member States of the European Union and observers from the non EU countries have contributed to the open debate, comparing and exchanging experiences and making available the national reports collected in this volume. Giovanni Cordini is full professor of Public Comparative Law, University of Pavia, Italy. Amedeo Postiglione is judge of the Supreme Italian Court of Cassation and Director of ICEF (International Court of the Environment Foundation).